Twin Star Exorcists or Sousei no Onmyouji is an ongoing Manga series by Yoshiaki Sukeno who does both the story and the art. It started serialization on the 4th of October 2013 in the Jump SQ magazine. An anime adaptation ran from April 6th, 2016 to March 29th, 2017 and had 50 episodes. As of today’s date, there are 62 chapters with all up until Chapter 52 in tankobon (volume) format. Twin Star Exorcists (TSE) follows the journey of two main characters, the male twin star Rokuro Enmadou and the female twin star Benio Adashino. 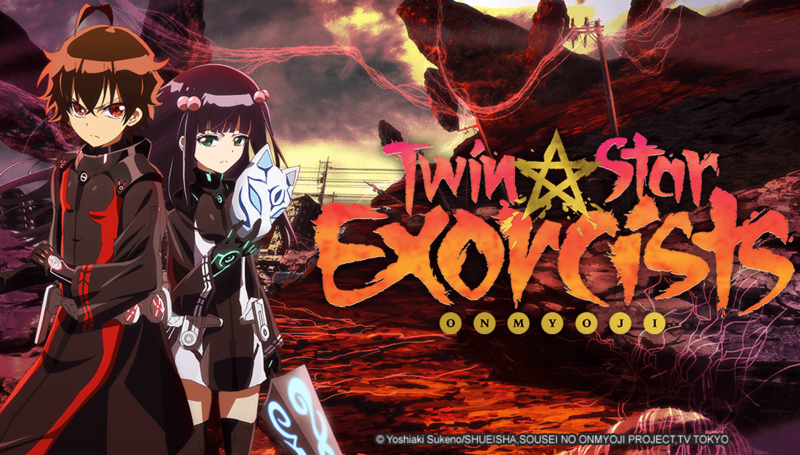 According to prophecy, the twin star exorcists are destined to have a child that is the reincarnation of the exorcist known as the Miko, which will be the ultimate exorcist, capable of cleansing all evil spirits, or Kegare, from the world, banishing them back to Magano (the impurity world) and ending the war that has lasted over a millennium. As always I would like to put a small disclaimer here. These are all my opinions and views on the manga and anime of TSE, I am in no way opposing any views anyone else may have about this series. With that out of the way, let’s begin. Sousei no Onmyouji. At first, I thought this was only a mere exorcism story that was only about fighting, friendship, and stuff which are rather mainstream nowadays but it’s nothing like that. This 4th work from manga author Yoshiaki Sukeno has emerged to be quite phenomenal in its unique traits. Not being extravagant of me. The story is unexceptionally appealing for me, it has its own dreadful side where these kids got to devote their lives as exorcists disregarding their cruel pasts about Kegare. Being forced by fate and responsibility these kids show unimaginable resolution for their age. In regard to the exorcism part of the story, it’s not less sophisticated. For example, there is so-called Miko the strongest of strongest exorcists assumed as a legendary in the history of exorcism. The Miko is the form of hope for humanity against impurities, and the requirement to obtain a Miko is the most interesting part of the story as well which involves Rokuro and Benio’s mutual life. Every detail given seems to be strongly responsible to make up its solid story structure. In other words we have great plot for this manga that successfully suffice my personal satisfaction for an amazing story sequence. It also has become much more solid after knowing both protagonists’ pasts. I suppose the further the story goes, the darker it will be, and more sacrifices will be revealed. This manga’s story pacing is excellent. It doesn’t rush its story so that readers will have enough time to comprehend what’s exactly going on and every problem that might require some further cognition in order to enjoy the story. The dialogues and narrations in this manga are also prone to follow, even beginner readers will find it easy and effortless. In addition, with some well placed mild jokes scattered in the story, it successfully enhances its own distinct impression. Furthermore, I really appreciate manga author who’s able to write and to build a story correctly starting from a solid backstory to story structure later on. Yoshiaki Sukeno has definitely proved himself to be one of them. Before I delve into both of the main characters and the abundance of lovable side characters. I must mention that Rokuro and Benio are two of my favourite characters of all time, and their relationship is so beautiful it hits me on the same level that Kirito and Asuna’s does. Focusing on the two main characters, Rokuro and Benio, Both are unique in their own traits. Starting from Rokuro, He was actually a boy who used to be a coward, quick-tempered, ignorant and loudmouthed. Traits you will find typical in most shounen characters, yet it’s quite distinct and different with Rokuro. While majority of characters in any shounen obtain motivations from their pasts to push forward, Rokuro is in fact the opposite. Rokuro had been traumatized no other by his own past until he quit being an exorcist 2 years before the beginning of the story. This distinction is probably Yoshiaki Sukeno’s characterization style applied to Rokuro as the male lead in the story. On the other hand, we have Benio, the female lead who was rather cold, confident, serious and straightforward. She despised Rokuro assuming he was just a coward who wouldn’t fight Kegare. However, she had yet to discover Rokuro’s past. Not as much as Rokuro’s past but Benio’s past can also be considered very grim, but undeterred by her past, she kept pushing forward and being stronger each day so as to exterminate Kegare. Initially, these two characters have no similar traits at all, that makes them almost impossible to be paired. However, along the way of the story they have stumbled upon a lot of misery, tragedy, and grief which have shaped Rokuro and Benio maturely. Since then, both of them have been thriving and striving to fight on their journey to become proper twin star exorcists in order to achieve their respective goals. The greatest part about these two characters is how much development and growth they get from each other, with Rokuro starting off as a very lackluster individual before meeting Benio, and growing into the stubborn, confident and lovable character he is now. Their relationship is special, from refusing to acknowledge the other, to becoming one of the most supportive couples in Anime and Manga history. Another major plus point for this manga is the character growth that each of the leads has character growth outside of each other aswell. Both Rokuro and Benio have extensive growth in joint and individual character arcs, whilst still remembering and referencing the other. The current story arc is an example of that. Moreover, every character in this manga is unique actually, not only to mention both main characters but all including the ruthless Kegare. To name a few of my favourites would be Shimon Ikaruga, Seigen Amawaka, his daughter Mayura Otomi and of the latest arc, Doctor Kan-chan too. The character drawing is neat with exact body proportions, so I have no problems when enjoying the character drawing. Expression of each character is nothing out of place too, every expression is placed accordingly to the existing situation, the expression drawings and placements are one of the most enjoyable things whilst reading TSE. I also like the drawing of the Kegare which is rather spooky. Nevertheless, If only the Kegare drawings were rougher, It’d be better. The way that the Kegare are illustrated however has its own charm and really brings out the terror they are said to inflict upon the world. For battle drawing, It’s nothing less than vicious drawing which makes it thrilling to experience. It utilizes thick stress lines to bring out character dynamism and impact of every action to become more realistic, I really like it. In addition the arts are getting better as well, especially in the recent chapters. I have to say the artist or author has made a significant improvement not only in the arts but also in the narrations and dialogues, perhaps only a little, but it’s still worth noticing. Character growth for the two main leads is incredible. I cannot express it in words. TSE is a very enjoyable Manga series to read, with a unique story and twists and turns that will always keep you wanting more. Each character has a unique personality and story and the world is very well developed. I would heavily recommend reading the manga and would place it in my top 5 alongside Nanatsu No Taizai (The Seven Deadly Sins), Full Metal Alchemist, Boku No Hero Academia (My Hero Academia) and Blue Exorcist, (Owari No Seraph/Seraph Of The End almost got there but fell a little short). However I would not recommend watching the anime, it is lackluster and diverts from the manga’s incredible story. The fights feel more intense and meaningful in the manga and there is little to none of the relationship development that is one of the best parts about the series, story and characters which is shown so brilliantly and ingeniously shown in the manga. If you are going to pick this up then read the manga and do not shame this series by watching the anime. Plays Games, Watches Anime, Drinks Tea, Listens to Panic!, Writes Code, Writes Novels and Reads A Lot.